le chaudron de vulcain – December 29 , 2018. EN. Indonesia : Anak Krakatau , Alaska : Cleveland , Iceland : Bárðarbunga , El Salvador : San Miguel ( Chaparrastique ) , Indonesia : Merapi . Home / Alaska / December 29 , 2018. EN. Indonesia : Anak Krakatau , Alaska : Cleveland , Iceland : Bárðarbunga , El Salvador : San Miguel ( Chaparrastique ) , Indonesia : Merapi . 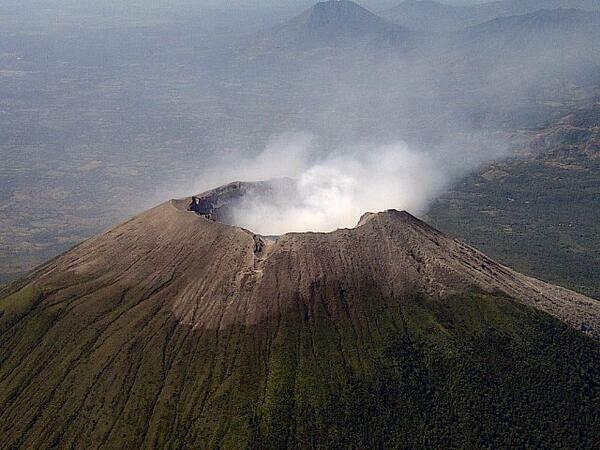 Recent development of activities of Anak Krakatau, PVMBG: altitude of the mountain only 110 meters. JAKARTA – Observation of the Center for Volcanology and Mitigation of Geological Disasters (PVMBG). The geological agency of the Department of Energy and Mineral Resources reported having observed visually on December 28, 2018 from 12:00 to 12:00, an eruption of a maximum height of the smoke column from 200 to 3,000 meters above the Mount Anak Krakatau crater with volcanic ash moving east-northeast. The weather is cloudy with the prevailing wind heading east-northeast. Then at 14:18, western time of Indonesia, the weather was clear and the smoke of the eruption did not continue. A type of Surtseyan eruption was seen because the magma coming out of Gunung Anak Krakatau’s crater came into contact with seawater. When there was no more eruption, it was observed that the summit of the Mount Anak Krakatau was no longer visible. Based on the results of the visual analysis, it was confirmed that Mount Anak Krakatau originally measuring 338 meters, now reached 110 meters. Previously, the PVMBG noted a change in the pattern of eruptions at 23:00 on December 27, 2018, namely the occurrence of sudden rashes. Surtseyenne eruptions occur around the sea level. Since the Pasauran PGA post, the position of the top of Mount Anak Krakatau is currently lower than that of the island of Sertung, which is in the background. For the record, the island of Sertung is 182 meters high and 132 meters long. The missing volume of Anak Krakatau is estimated at between 150 and 180 million m3, while the remaining volume is currently estimated between 40 and 70 million m3. 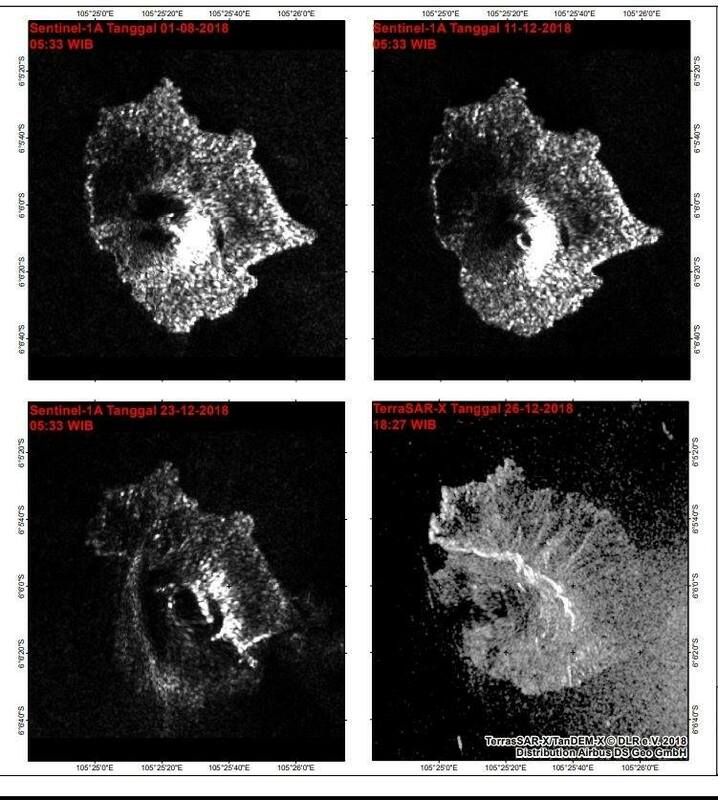 The reduced body size of Anak Krakatau is estimated due to the volcanic body collapse process which is accompanied by a high eruption rate from December 24 to 27, 2018. The process of visual observation continues to obtain more accurate calculation results. At this moment, the rash is impulsive. Just after, there was no more smoke coming out of the crater of Mount Anak Krakatau. There are two types of eruptions, namely Strombolian and Surtseyenne eruptions. The potential hazard of the Gunung Anak Krakatau eruption in its current conditions is the most likely occurrence of Surtseyan-type eruptions. This type of eruption, because it occurs on the surface of the sea, although it can produce a lot of ash, will not be a trigger of tsunami. The potential danger of incandescent lava emission still exists. As the volume remains small, the risk of a tsunami is relatively low, unless the fault / fracture structure in the Sunda Strait is reactivated. Based on the results of the observations and visual and instrumental data analysis conducted up to 28 December 2018, Gunung Anak Krakatau’s level of activity is still at Level III (SIAGA). For Level III (SIAGA), it is recommended that the community not approach Mount Anak Krakatau within 5 km of the crater, prepare masks to anticipate the occurrence of ash rains. Residents of the coastal areas of Banten Province and Lampung should be calm and carry out their activities as usual, always following the instructions of the local BPBD. The Anak Krakatau volcano, located in the Sunda Strait, is a type A volcano and is a young volcano that appears in the caldera, after the paroxysmal eruption of 1883 volcanic complex of Krakatau. The eruption activities after the collapse began in 1927, when the volcanic body was still under the surface of the sea. The body of Anak Krakatoa has reached the sea surface since 1929. Since then, the Mount Anak Krakatau is in the construction phase (his body becomes bigger). In 2016, an eruption occurred on June 20, 2016, while in 2017, an eruption occurred on February 19, 2017 in the form of a Strombolian eruption. 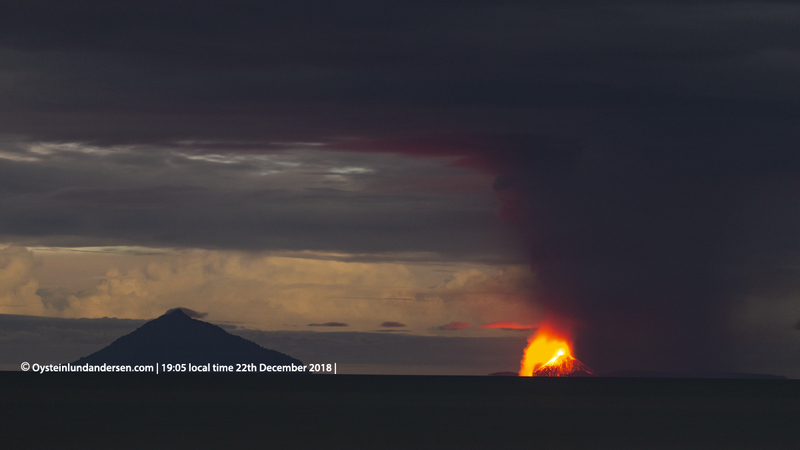 In 2018, it has again increased its activity since June 29, 2018 until now in the form of a Strombolian eruption. Photo et vidéo : Øystein Lund Andersen. Local seismic sensors recorded a short-lived explosion today at 3:17 UTC December 29 (18:17 AKST December 28). 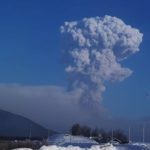 A pilot report indicates an ash cloud to 17,000 ft asl. Local winds are from the west. Explosions from Cleveland typically produce relatively small volcanic ash clouds that dissipate within hours; however, more significant ash emissions are possible. Photo : Lyons , John . A powerful earthquake measuring 4.8 occurred on the northern rim of the Bárðarbunga volcano in the early hours of Friday morning, RÚV reports. The initial earthquake was followed by three aftershock quakes measuring 3.5, 3.7 and 2.8. 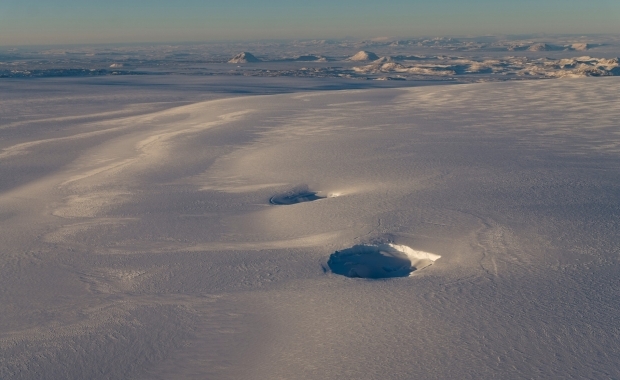 Earthquakes have shaken Bárðarbunga since the end of its most recent eruption, which began in August 2014 and ended in February 2015. Einar Hjörleifsson, the Icelandic Met Office’s natural disaster expert says these eruptions have been getting larger as they’ve gone along, but this is only natural as the volcano recovers from its immense eruption. At the time of writing, there were no signs of volcanic unrest at Bárðarbunga, says Einar, but any developments will be closely monitored going forward. Source : Larissa Kyzer , 28 décembre 2018 , Eruption, Nature, Nouvelles . Special report. The fumarole activity continues and the amplitude of the seismic signal increases on the Chaparrastic volcano. The activity of fumaroles persists since the crater of the Chaparrastic volcano (Figure 1). 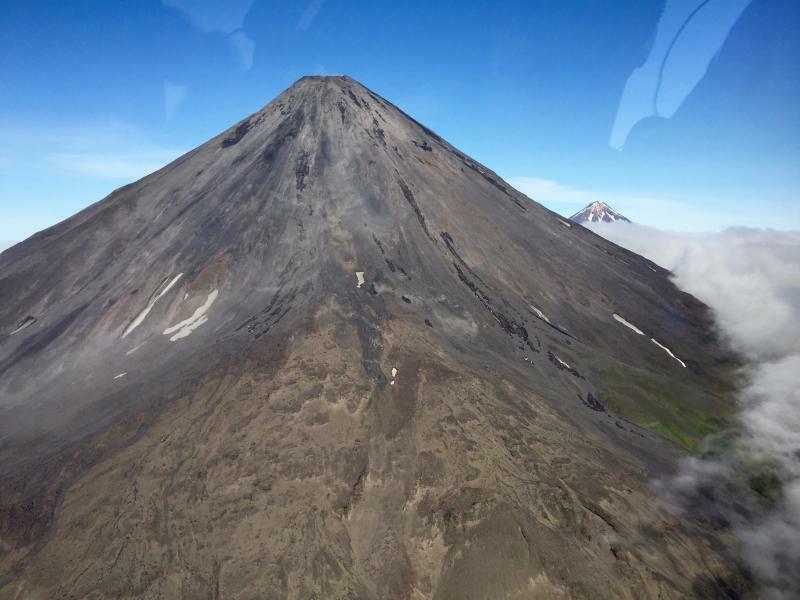 The passage of fluids through the internal system of the volcano results in an increase in the amplitude of the seismic signal recorded from 6 am on Thursday 27 December (Figures 2 and 3). The flux of sulfur dioxide released into the atmosphere fluctuates according to the DOAS station records located in the municipality of San Jorge (Figure 4). The above shows the active state of the volcano. Figure 1. The emission of small pulses of gas persists and rises between 100 and 150 meters from the crater. 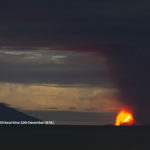 Information from the local observers’ network of the volcano area indicates that the gases descend along the southwest flank of the volcanic structure, under the control of prevailing wind direction in the region. Figure 2. Behavior of seismic signal amplitude (RSAM) in mean time. Figure 3. Seismograms of the last seven days recorded in the VSM station located in the upper third of the northern flank of the volcano. The recording in tonnes per day of the flow of sulfur dioxide shows fluctuations, indicating that the degassing rate is not constant and can be correlated with the appearance of pulses of gas emitted into the atmosphere by the crater of the volcano. Figure 4. Behavior of the sulfur dioxide flux recorded in December at the station located in the municipality of San Jorge. The observation of these fluctuations that can evolve over time is evidence of the active state of the Chaparrastic volcano. For this reason, the MARN continues to strengthen its surveillance system by maintaining close communication with the Directorate General of Civil Protection and local observers. .
Due to the current situation of the activity of the volcano, the degassing indicated in the last hours could be maintained, so that the influence of the gases leaving the crater and transported in the direction of the wind can reach the inhabited areas located between the South and the west of the volcano and make the sulfur smell in the area between El Carreto and Piedra Azul. In case of increased activity, the most likely scenario would be the generation of an eruptive column, whose ashes could fall in the municipalities of San Rafael Oriente, San Jorge and Chinameca. The production of ballistic projectiles is not excluded in this scenario, up to three kilometers around the crater. However, the possible production of lava flows from the flanks of the volcano is less likely to exist. The ministry calls on the general public not to approach the upper part of the volcano, because of the danger it represents. And he asks residents of the region to remain attentive to information provided by official means and to avoid making use of rumors from unofficial sources. The next update will be Friday, January 4, 2019. In the event of a material change, an advance special report will be published. MERAPI ACTIVITY REPORTS, December 21/27, 2018. The weather is sunny in the morning and the afternoon and evening misty. The observed smoke is white, thick, with low gas pressure. The maximum height of 125 m is observed from the observation post on Mount Merapi in Selo on 27 December 2018. Dome of lava and morphology of the peak. Morphological analysis based on photos of the Southeast sector showed morphological changes in the form of dome growth. Annex 1.a presents morphological analysis of the peak via the Deles camera station. The volume of lava domes at 27 December 2018 was 389,000 m3 with an average growth rate of 2,300 m3 / day, higher than the previous week. Currently, the lava dome is still stable with a low growth rate (<20,000 m3 / day). Appendix 1.b presents an analysis of the lava domes from the Puncak camera stations. In this week, seismographs of Mount Merapi recorded 19 emission earthquakes (DGs), 5 superficial volcanic earthquakes (VTB), 7 multiple-phase earthquakes (MPs), 264 avalanche events (RF), 11 earthquakes Low frequency (LF) and 7 tectonic earthquakes (TT). The VTB earthquakes this week were larger than the previous week. The deformation of G. Merapi, which was monitored by EDM and GPS this week, showed no significant change. This week’s DOAS (Differential Optical Absorption Spectroscopy) measurement resulted in an average value of Mount Merapi’s maximum SO2 emissions of 77.14 tonnes / day, still within normal limits. This week, the Mt. Merapi observation post on the 22nd of December, 2018, rained down with a rain intensity of 30 mm / hour for 50 minutes. The post has not been reported, neither lahars nor increased flow in the rivers downstream of Mount Merapi. • A radius of 3 km around the summit of Mount Merapi should be prohibited to population activities and climbing. • If there is a significant change in Mount Merapi activity, Mount Merapi activity status will be re-examined. • With regard to the time of entering the rainy season, people moving around the rivers in Avaldu Mount Merapi should be aware of the danger of lahars. Video : Galih Jati, Volcanodiscovery.